William Phillips Hand Signed Limited Edition Canvas Giclee: "Rolling on the River"
Edition: Artist Handsigned and Numbered to 100 with COA. 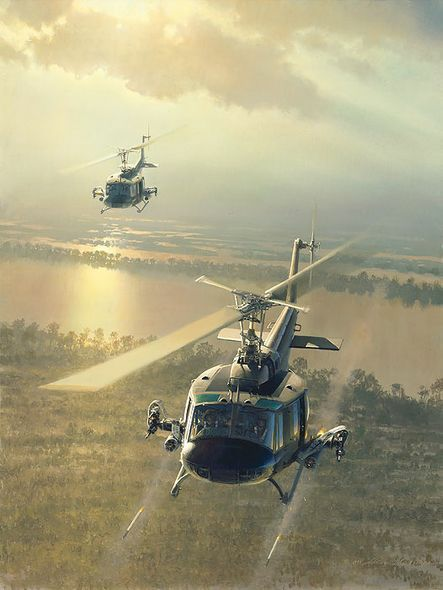 About the Art: Rollin' on the River� Two rocket-firing Bell UH-1 Iroquois helicopters weave in combat over South Vietnam's hazy Mekong Delta, as if dancing to the rhythm of the classic lyrics made famous by Rock and Roll Hall of Fame singer Tina Turner. Better known as "Hueys," these rotary-winged birds augmented existing aircraft in Vietnam in 1963 and, prior to the end of the conflict, they numbered 5,000. In great demand and used extensively, the Huey served in command-and-control, in medical evacuation, in the transportation of personnel and materiel, in air assault and as gunships.